Founded as a traditional fine arts museum and cultural center, over the past four decades the Fuller Craft Museum has transformed itself into a collection devoted entirely to crafts, one of only eight such museums in the US. New England’s only museum of contemporary craft presents A Lighter Hand: The Glass Drawings of Michael Janis, on display Aug. 6 – Nov. 6, 2011. One of the new works Michael has made for the exhibition is a site-specific sculpture that measures 8′-0″ and will be installed in floor to ceiling window of the exhibition space. ,,,”Janis’ work is the result of a laborious and challenging process. 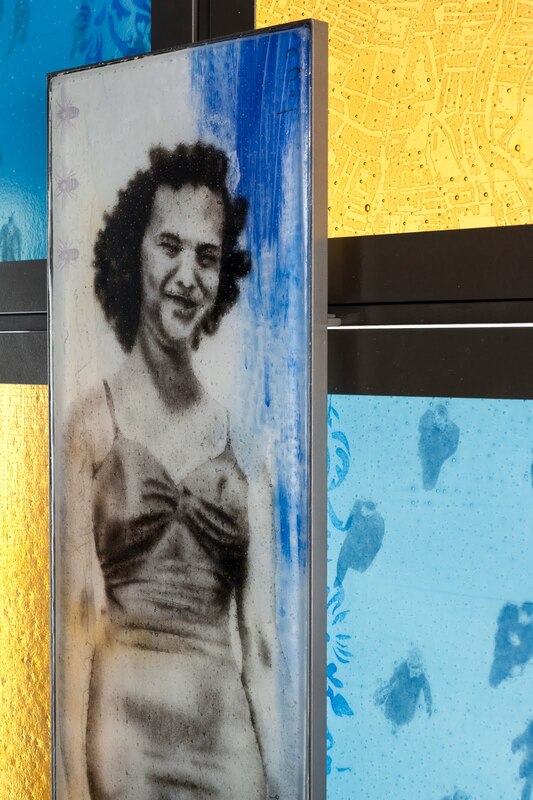 Similar to sgraffito, where a design is scratched through a colored ground revealing another color beneath; to produce the image Janis sifts black glass powder onto sheet glass, scraping away the powder to produce the detail. The image is suspended between layers of sheet glass and fired in a kiln to fuse the constituent pieces together. In this manner any number of images can be combined to produce complex juxtapositions. The result is a collage produced entirely in glass, built from a time-consuming process allowing for an extended contemplation of his subjects. 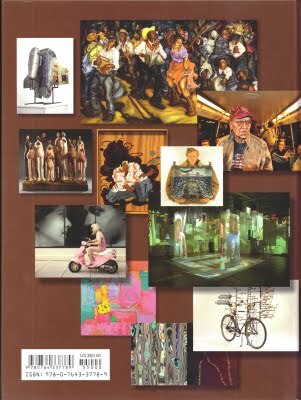 Building on the legacy of Surrealist artists of the early 20th century, in particular Giorgio de Chirico whose paintings juxtaposed disparate objects in moody and indistinct landscapes, Janis is able to construct a contemplative feeling from the layering of seemingly inanimate objects and ambiguous characters. His images in glass, particularly those examples in a tall and narrow format, also allude to the narrative quality of stained glass. 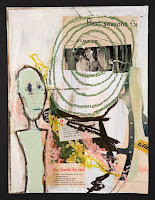 The juxtaposition of text, symbols, and figures seem to imply a hidden message or meaning, but like an ink blot or word association Janis leaves the viewer to provide their own conclusions. Janis lives and works in Washington, DC, where he is Co-Director and an instructor at the Washington Glass School. He first began working with glass as an architect, evident in his dedication to sheet glass and the precision draftsmanship in his drawings. 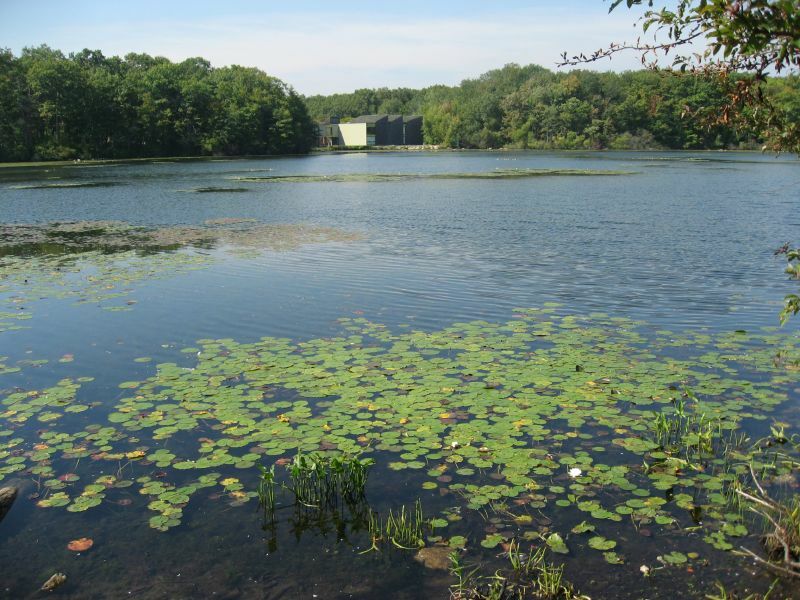 A lecture by Michael Janis precedes the public reception – click HERE for more information. Book Release Party for "100 Artists of Washington, DC"
This weekend, the book release party was held at the beautiful Conner Contemporary Art Gallery in Washington, DC. 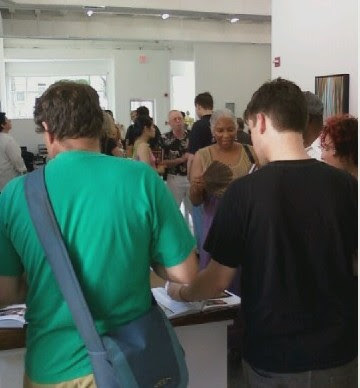 As the Mid-Atlantic sweltered in record-breaking high temperatures, the cool crowd was in force at the book reception. The book is incredible – the production quality is very high and the selection of the artists represented and the artwork included all contribute to a fantastic compendium of the best of the DC area art scene. Though I understand the first set of books from the publisher is already sold out at places like Amazon Books, more books are due soon. 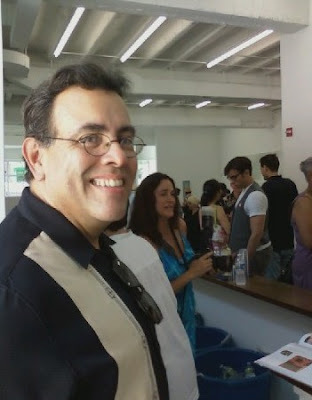 Artist/Author F Lennox Campello at his book release, held at Conner Contemporary. The crowds braved the heat to get their first look at the book. Tim Tate waves a jaunty ‘hello’ to this intrepid reporter. 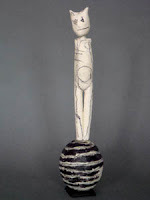 >The 26th Penland School of Crafts Benefit Auction takes place August 12-13, 2011. This gala weekend in the North Carolina mountains featuring the sale of more than 200 works in books, clay, drawing, glass, iron, letterpress, metals, painting, photography, printmaking, textiles, and wood. 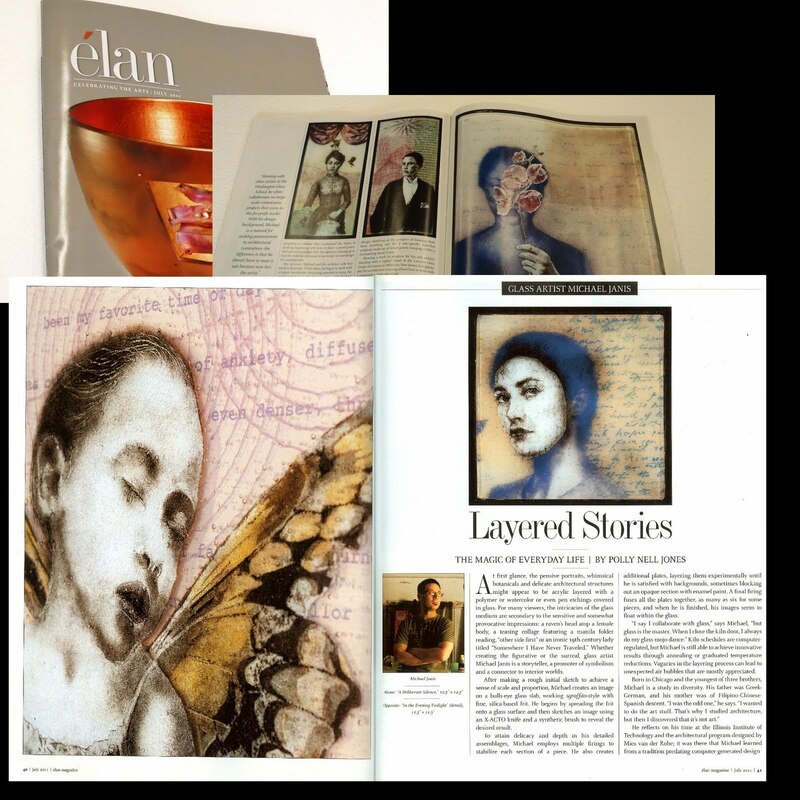 The Penland auction is one of the most important craft collecting events in the Southeast and a perfect opportunity to support Penland’s educational programs, which have helped thousands of people to live creative lives. Work by WGS Director Tim Tate is featured in the auction – and one of the works is previewed below. Glass is an wonderfully versatile material that has a long been a part of functional craft and decorative art and, in the past half-century, has become increasingly important as a sculptural material. Although glass is rigid and unyielding, it is worked as a liquid or a semi-solid, making it receptive to almost any form. It can be transparent, translucent, or opaque, and it can be made virtually any color. Naturally shiny, it can be sandblasted or acid etched to produce a matte or frosted surface. Glass can be manipulated directly with tools or well-insulated hands; it can be poured, blown, or melted into molds; it can be shaped after being selectively heated over a torch. It is a material capable of seducing both the maker and the viewer. 18 x 36 x 8 in. Click HERE to jump to the full Auction Catalog. The Glass School Gang celebrates Rob Kincheloes birthday at Franklin’s Restaurant. L-R: Michael Janis, Tim Tate, visiting artist Melissa Stern, Erwin Timmers, Robert Kincheloe, Sean Hennessey & Nancy Donnelly. Photo by Chip Montague. 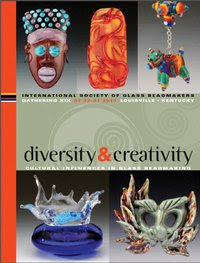 2) Wish Rob well at the International Society of Glass Beadmakers (ISGB) Gathering in Louisville, KY, opening the 27th. Rob will be presenting at the conference, and he promised photos for to post on the school blog. Looking forward to the postings! The Capital Fringe Festival continues its July Festival performances. Capital Fringe Festival is the only major unjuried, self-producing, open-access Festival in the Washington, DC area and occurs in July each year. The Fringe Festival provides all artists, whether new or established, a venue to express and develop their talents and artistic visions in total freedom. One of the events is MatchGame DC – where area celebrities have agreed to sit on the answer panels for a live version of the classic TV Game Show presented live on stage. Proceeds to benefit 3 local charities: Food & Friends, The DC Film Alliance and The Washington Literacy Council. Our Tim Tate is one of the artists performing in the silly, naughty fun. 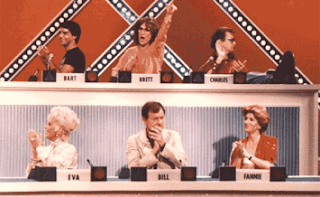 Go see Match Game DC, no matter how you feel about game shows, DC celebrities, or improv-based, audience participation-filled semi-theater, because in the end, it supports three really important causes. When:Saturday, July 23rd, at 9 p.m & Sunday, July 24th, at 6:30 p.m.
More info on MatchGameDC – click HERE. 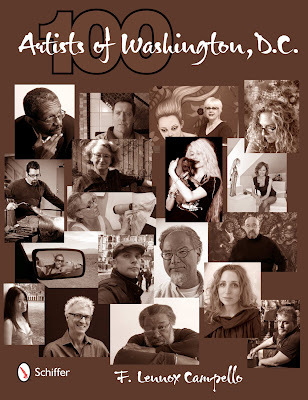 The 100 Washington, DC Artists book should be available at most DMV area bookstores very soon and a book release party will be held this Saturday, July 23rd at Conner Contemporary in DC. The book release party is by invitation only, so please RSVP to lenny@lennycampello.com if you’d like to be added to the invite list or RSVP on Facebook here. Most of the artists will be there, so this is your chance to get your copy signed by them. You can bring your own copy or a very limited number of books will be available for sale at the party. The book is also available online at the usual sites (Amazon, Barnes & Noble, Target, etc.) or directly from the publisher. If you want to support your local bookstore, you can have them order it for you here. Kids & glass – the perfect companions! Prince George’s County Brentwood Arts Exchange has its summertime Creative Expressions Camp where kids get to explore a variety of artistic media as well as contemporary reading and writing activities around such themes as animals, nature, and adventure. 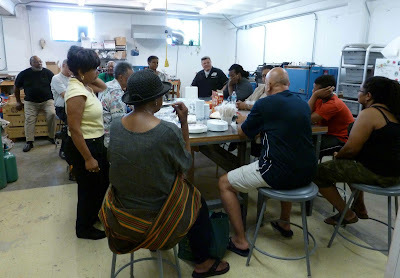 One of the camp sessions (the adventure one) was held at the Washington Glass School. Rob Kincheloe helps direct the children on the finer aspects of working in glass. Artistic expressions are nurtured (ie yanked out) from each student. Mini masterpieces inside the kiln. This past weekend, the Washington Glass School was host to the Black Artists of DC (BADC) monthy meeting. 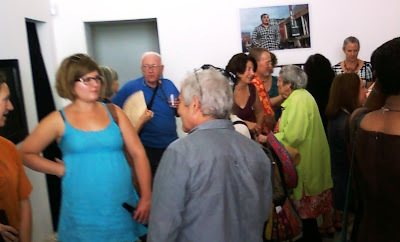 The artist group often conducts studio visits as a way to network and offer new opportunities for the members. The mission of BADC is to promote, develop and validate the culture, artistic expressions and aspirations of past and present artists of Black-Afrikan ancestry in the Washington, DC metropolitan area. Click HERE to jump to BADC’s facebook page. 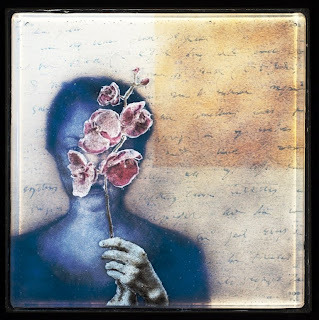 At first glance, the pensive portraits, whimsical botanicals and delicate architectural structures might appear to be acrylic layered with a polymer or watercolor or even pen etchings covered in glass. For many viewers, the intricacies of the glass medium are secondary to the sensitive and somewhat provocative impressions: a raven’s head atop a female body, a teasing collage featuring a manila folder reading, “other side first” or an ironic 19th-century lady titled “Somewhere I Have Never Traveled.” Whether creating the figurative or the surreal, glass artist Michael Janis is a storyteller, a promoter of symbolism and a connector to interior worlds. After making a rough initial sketch to achieve a sense of scale and proportion, Michael creates an image on a Bullseye glass slab, working sgraffito-style with a fine silica-based frit. He begins by spreading the frit onto a glass surface and then sketches an image using an X-ACTO knife and a synthetic brush to reveal the desired result. To attain delicacy and depth in his detailed assemblages, Michael employs multiple firings to stabilize each section of a piece. He also creates additional plates, layering them experimentally until he is satisfied with backgrounds, sometimes blocking out an opaque section with enamel paint. A final firing fuses all the plates together, as many as six for some pieces, and when he is finished, his images seem to float within the glass. “I say I collaborate with glass,” says Michael, “but glass is the master. When I close the kiln door, I always do my glass mojo dance.” Kiln schedules are computer-regulated, but Michael is still able to achieve innovative results through annealing or graduated temperature reductions. Vagaries in the layering process can lead to unexpected air bubbles that are mostly appreciated. He reflects on his time at the Illinois Institute of Technology and the architectural program designed by Mies van der Rohe, it was there that Michael learned from a tradition predating computer-generated design programs – a tradition that emphasized the basics of drafting beginning with how to shave a pencil point. Michael acknowledges that the rigorous training gave him the skills he continues to use to lay out and design his constructions. For 10 years, Michael and his architect wife Kay lived in Australia. While there, he began to work with art glass installation. Returning stateside in 2003, the couple ended up in Washington, D.C., with Michael determined to work with glass full time. At the Washington Glass School, where Michael is now a co-director in charge of public art and architecture, his desk is piled with papers helter skelter, not at all in keeping with the precision and detail of his work. Several weeks before a show, he shrugs, chuckling at the prospect of looming deadlines, including one for a site-specific eight-foot sculpture made up of seven panels hanging within a freestanding metal frame. Showing a work in progress for his solo exhibit, A Lighter Hand, at the Fuller Craft Museum in Brockton, Massachusetts, he explains that his architecture training allows him to work with a composition from any angle. “I was often working upside down on drawings because another architect was working on the drawing on the other side,” he says, comparing the process of manipulating the frit to creating sand painting. Though it seems obvious that walking in front of a fan while moving a piece of art with loose frit to the kiln is not a good idea, Michael finds that students still need to be reminded of such risks. While working with other artists at the Washington Glass School, he often collaborates on large-scale commission projects that come to the for-profit studio. With his design background, Michael is a natural for making presentation to architectural committees – the difference is that he doesn’t have to wear a suit because now he’s the artist. Michael’s portrait of his mother includes a map of Manila, timepieces and drafting sketches. 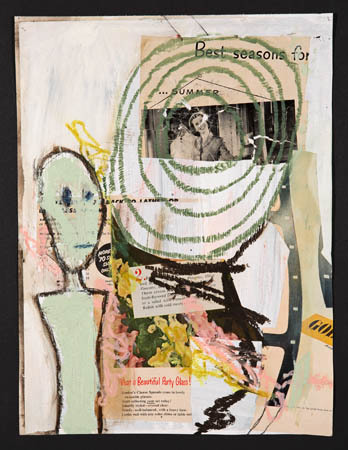 Robert Rauschenberg’s collages and Dadaist influences sometimes informs his work. He says he likes viewers to draw their conclusions about meanings. However, he does admit that poetry, symbolism and the magic of everyday life are guides he follows by scratching the surface to plumb the proverbial riddle of life. During last month’s GlassWeekend show at the biennial International Symposium and Exhibition of Contemporary Glass in Millville, New Jersey, Michael was designated as “Rising Star.” It is only one in a growing list of awards for Michael, who has been tapped for a Fulbright Teaching Scholarship that he hopes to complete at the National Glass Centre in Sunderland, England. 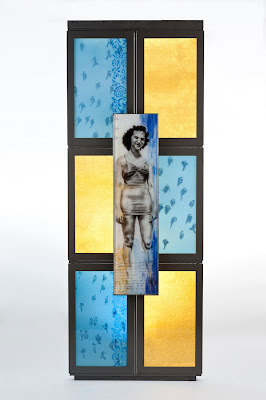 In 2010, he received the California Bay Area Institute Saxe Fellowship, and he was named Outstanding Emerging Artists by the Florida Glass Art Alliance in 2009. 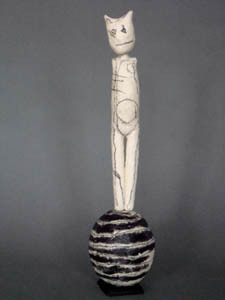 Michael is represented by Maurine Littleton Gallery in Washington, D.C. The Washington DC Real Estate and Architecture blog, DC Mud has an insightful review of the architectural design and applications of glass by the Washington Glass Studio. The article provides a synopsis on a number of WGS design projects – their history and some great photos of the finished works. Design writer Beth Herman reveals the origins of some of the glass techniques and process used by WGS: “…But he revealed their signature prowess evolved from an Erwin Timmers experiment, and has essentially been a work in progress over the last decade. m.l. duffy working on cast glass made from recycled glass for Safeway Inc project. For the link to the entire DCMud article link – click HERE.